Back in the 80s I worked at Rankin Bass doing character designs. 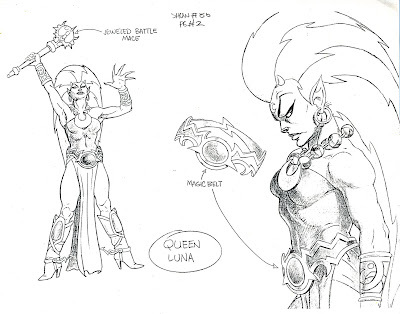 Here are the two incarnations of Queen Luna. The bottom drawing is really nice. I also love the comic you posted below. You have a really nice way of constructing characters. Yeah I often wonder what my actual style is or if I even have one. Doin' OK, thanks. Why isn't this blog in your profile? You should add it. Holy crap, I just read on Wikipedia, the founder of Penthouse Comicx committed suicide after he got fired for low sales. What was it like working there? I just did the one job freelance. I heard he embezzled money and got caught. He was a very large man and he jumped from an upper story inside a hotel. Went through to the lower floor. Big mess. Boom! They were all crappy studios back then. Rankin Bass was actually a very cool placve to work. As jobs go, it was a really great one! There's always something crappy about everywhere I've ever worked. The key is to have fun, learn and enjoy the company of other artists. these are cool even if they aren't cartoony they are still super solid and well designed. the bottom drawing is great. was that a break from working on the more realistic designs at rankin bass? i don't remember them doing cartoony stuff. The thing about the cartooniness is they pretty much let me do whatever I wanted. I almost never had a design rejected or changed. I made plenty of pretty cartoony characters but made sure the construction was solid and realistic. Hey, first time here..Rankin-Bass wasn't crappy before the 80s, by the time that decade rolled around studios started copying some "generic" design and doing basically the same boring stuff..I mean, R/B before that had classic specials and DISTINCTIVE design from people like Paul Coker, Jr.and others.